The 34th annual SwimShow will be held July 16 – 19, 2016 at the Miami Beach Convention Center. 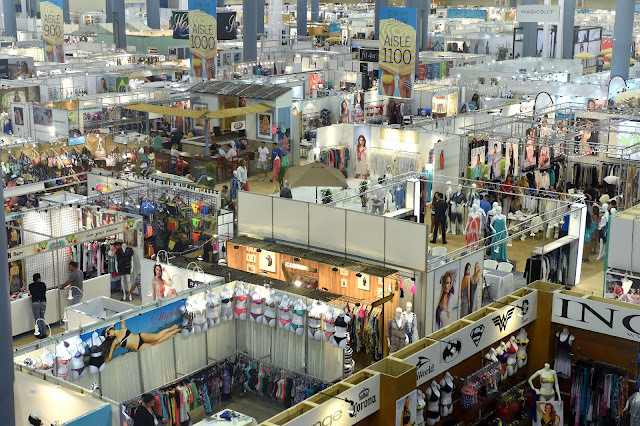 The longest running and most prestigious trade show dedicated to the international swimwear community, SwimShow is the must-attend event of the buying season. Providing the setting for the largest gathering of retailers, manufacturers and other industry representatives to meet annually under one roof, the event brings together the world’s most influential buyers with the most exciting swimwear brands from around the globe. This year, SwimShow will host its first Collection area strategically placed in the middle of the show floor. The Collection is a curated fashion environment created for discovering the best emerging and established swimwear designer brands in the industry. The modern and polished platform has been created to emphasize each individual brand’s identity with the focus on the product. Buyers will have an opportunity to engage with brands in a one-on-one unique intimate environment that will allow them to gather personal insights into the collections. Retailers are invited to experience this beautifully encased luxury oasis, while enjoying champagne butler service, a VIP lounge area, free access to Wi-Fi (also available throughout the tradeshow). "SwimShow is constantly adapting and improving to better meet the needs of our attendees and exhibitors, and The Collection is the latest example of these efforts," Judy Stein, executive director, SwimShow said. "This newly designed area will cultivate a new shopping experience on the Show Floor." Other special events surrounding the SwimShow will include a fit seminar, Swim Lounge Happy Hour, informal modeling, an evening cocktail reception, a daily breakfast bar, and High Tea service every afternoon allowing for networking. We are also incorporating amenities such as a dry and braid bar, nail salon for quick touch-ups, henna bar, up to the minute social media engagement and so much more for our buyers and media guests. Some of the designer brands to look forward to seeing throughout the show include A.Che, Agua Bendita, Agua de Coco, ale by Alessandra, Amir Slama, Amuse Society, Baes and Bikinis, Bella Tu, Beth & Tracie, Cecilia Prado, Chio di Stefania D, Chloe Rose, Cynthia Rowley, Dea Rosa Athens, Despi, Elizabeth Hurley Beach, Eskini, Feraud Paris, Flor de Piel, Gluck, Gottex, Heidi Klum, Helen Kaminski, Huit, Isabella Rose, JADEtribe, Jets, L*Space, Letarte, Lise Charmel, Luli Fama, Maaji, Marlies Dekkers, Maryan Mehlhorn, Milly, Nanette Lepore, Nicole Miller, Onda de Mar, Onia, Parker Beach, PilyQ, Pitusa, Posh Pua, Rachel Roy, Robin Piccone, Robyn Lawley, Seafolly, Shoshanna, Strong Boalt, Taj by Sabrina, Temptation Positano, Touche, Trina Turk, Vitamin A, William Rast, and many more. Due to the upcoming three-year renovation of the Miami Beach Convention Center, SwimShow adapted a more stringent selection process guaranteeing a more cohesive and discerning group of exhibitors. SwimShow is the premier resource for buyers from all swimwear categories, and caters to designer boutiques, resort shops, specialty stores, surf shops, department stores, mass merchants and more. This global trade show includes buyers, manufacturers, designers, corporate personnel, press, bloggers, fashion consultants, stylists and other fashion industry leaders. SwimShow features a variety of iconic women’s, men’s and children’s swimwear companies. Thank you for taking the time to read our fashion industry event blog post. We hope that you have found this news to be informative. Learn more about swimwear by attending the 2016 SwimShow.